I’m living in giant sweaters and boots, and just got a new coat. I painted my nails red this weekend and settled in for a Gilmore Girls marathon (that burgundy pre-Instagram filter on the opening credits just instantly puts you in the fall mood). And I’ve had my favorite Christmas-y smelling candle lit all weekend. 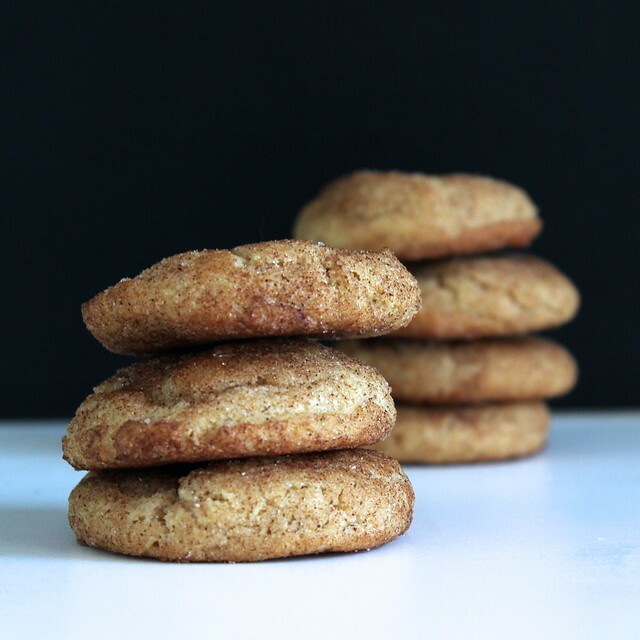 So obviously this weekend when I settled in for some baking, I knew I needed cinnamon and browned butter involved, and it seemed the logical next step to throw in some other winter/autumn spices: cardamom, nutmeg, allspice, cloves, and ginger. 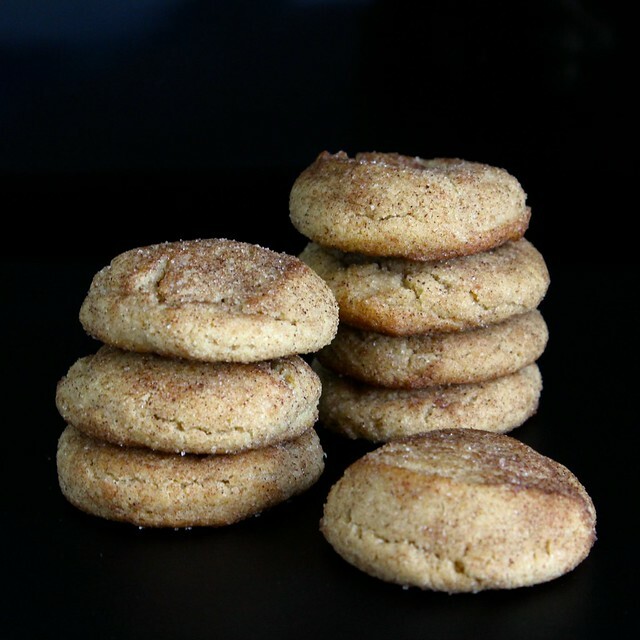 They are crisp on the outside and cakey on the inside–the perfect snickerdoodle. Melt the butter in a saucepan over medium heat until browned and foam subsides; the butter will smell nutty and caramelly. 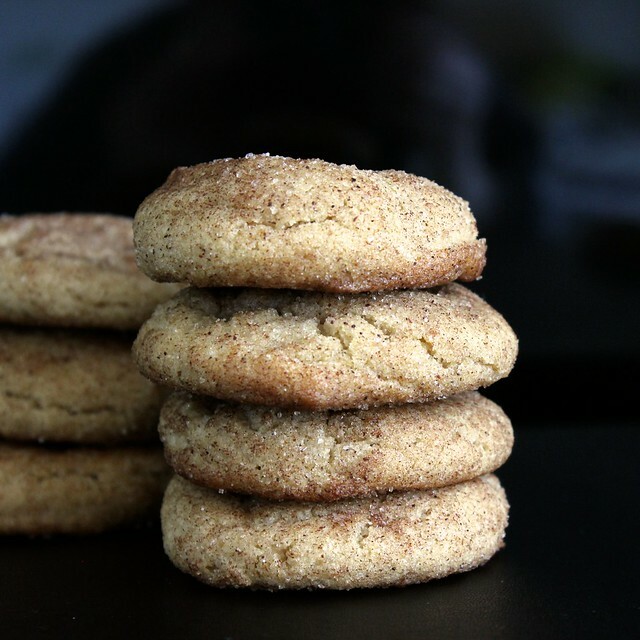 Pour the browned butter into the bowl of a stand mixer fitted with the paddle attachment and beat on medium-low speed for about 5-7 minutes–this will bring it to room temperature. Meanwhile, whisk together the flour, cream of tartar, baking soda, 1/2 tsp of cinnamon, spices, and salt in a medium bowl. Then, in another bowl, whisk together the eggs and the milk. 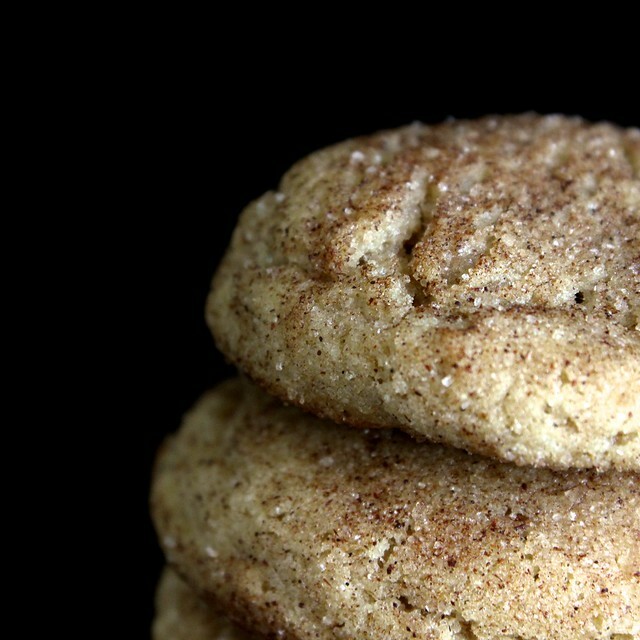 Once butter is cooled, turn it off and add 1 cup of granulated sugar and all the brown sugar. Beat on medium for 2 minutes; scrape down the sides, beat quickly again, then turn to low and stream in the egg mixture. Beat until thoroughly combined, about 30-45 seconds. Add the flour mixture in three parts, beating until just combined each time. Gather the dough into a mound in the center of the bowl, cover with cling wrap, and refrigerate for at least 1 hour (or up to 24 hours). Preheat the oen to 400 degrees F and line baking sheets with parchment paper. In a shallow bowl, stir together the remaining 1 1/2 tablespoons of sugar and 1/2 tablespoon + 1/2 tsp of cinnamon–mixture should be all the same in color. If desired, you can add a pinch of cloves and a pinch of cardamom to this mixture to enhance flavor. 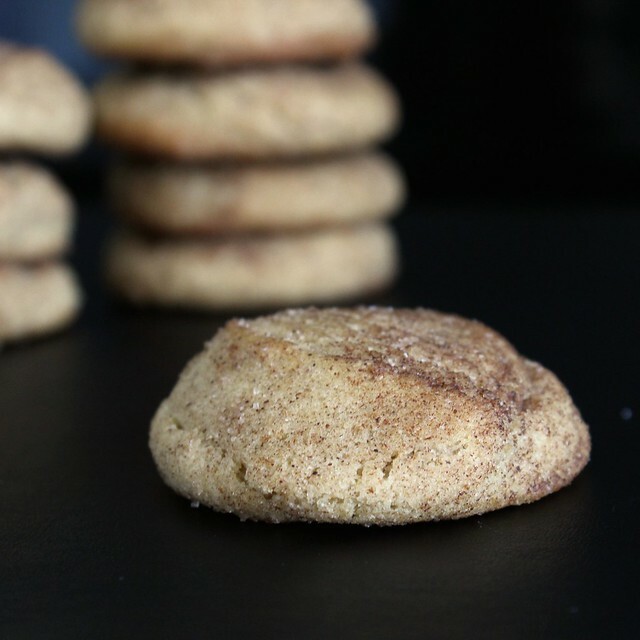 After chilled, use a small 1-tablespoon capacity cookie scoop to scoop dough into balls and roll in the cinnamon sugar mixture. Place cookies about 1 inches apart onto sheets and bake for 10-12 minutes each. They’ll be chewy and a tad undercooked in the middle, with cracks at the top. Cool 10 minutes on the pans, then remove to wire rack. Store at room temperature in an airtight container up to 3 days. 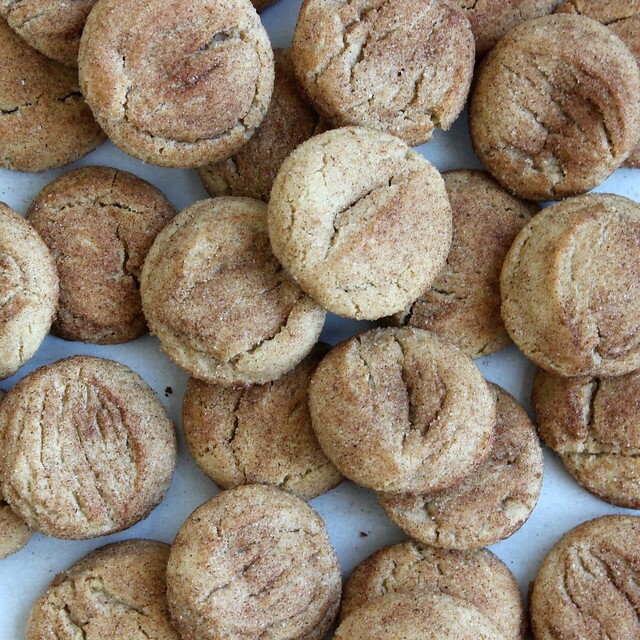 It’s not quite fall in Florida yet, but you sure made me want to bake some Snickerdoodles.